A winter back-loaded with cold, snow and high water can make the season’s stay seem unusually long and especially harsh. The first warm days of the year never come soon enough. But when they do, a feeling of euphoria sweeps over anglers because springtime offers some of the year’s best opportunities for trophy largemouth bass. “Fall is a great opportunity to catch a big one, but your best shot at the biggest bass of the year or your life is right now,” said Geoff Roberts, a conservation educator with the Kentucky Department of Fish and Wildlife Resources and an avid bass angler. The longer periods of daylight and the warming water temperatures of springtime tell largemouth bass that it’s time to move shallow. It’s also at this time when the big bass are at their heaviest, especially ravenous females that must pack on weight in preparation for spawning. 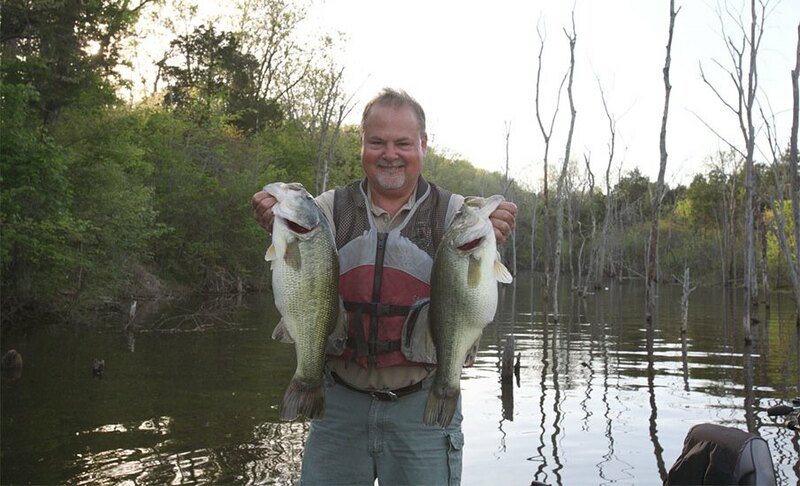 Kentucky boasts numerous lakes that hold “good” to “excellent” populations of largemouth bass. In its annual Fishing Forecast, Kentucky Fish and Wildlife classified almost 40 fisheries in those two categories. Anchoring the list of “excellent” largemouth bass options are Kentucky Lake and Lake Barkley in the west and Barren River Lake in the southwest. Also making the cut were 760-acre Beshear Lake in Caldwell and Christian counties; 8,270-acre Cave Run Lake in Bath, Menifee, Rowan and Morgan counties; and 784-acre Cedar Creek Lake in Lincoln County; 32-acre Fishpond Lake in Letcher County; 767-acre Lake Malone in Muhlenburg, Todd and Logan counties; 169-acre Wilgreen Lake in Madison County and 36-acre Spurlington Lake in Taylor County. Fish population survey work conducted by fisheries biologists last May on Cedar Creek Lake found vast numbers of 19- to 21-inch largemouth bass. There is a one-fish daily creel and 20-inch minimum size limit on the lake. Anglers have been catching bass in the creeks, and the areas around the KY 1770 bridge and mid-lake boat ramp near old U.S. 150 are two proven spots in a lake full of them. Wilgreen Lake’s bass population stood out in last year’s research in the northeastern fisheries district. It yielded good numbers of fish over 15 inches and 20 inches, but bass don’t have to search hard for food with gizzard shad prevalent in the lake. Grayson Lake in Carter and Elliott Counties showed improvement last year, earning the 1,512-acre reservoir up-and-comer status in this year’s Fishing Forecast. Bass typically start to move shallow when the water temperature ranges from 55 to 65 degrees with farm ponds and smaller lakes warming up first. Good lures to have on hand in early spring are jig and trailer combinations, spinnerbaits, square-billed and lipless crankbaits, suspending jerkbaits and other shad imitations. Try to intercept bass at spots that lead to spawning areas, Roberts said, such as deeper points and the deeper stretches of banks that lead into embayments, creeks or a big pocket, and work back. “What you want to try to find are basically what bass use as highways,” he said. “Bass like to feel secure and they like to have ambush points, so they’re going to use whatever cover is available as they work their way back in until they go to where they’re going to spawn. And then they’re going to do the exact same thing coming back out. Spring fishing is grateful fishing, and the thrill of an early spring reunion with the water never grows old. The pull of a trophy largemouth bass only makes it better.